Craving a juicy cheeseburger? 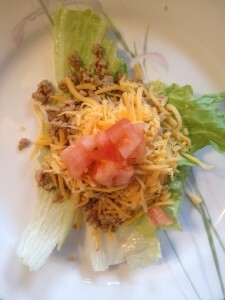 Try the Cheese Turkey Burger Lettuce Wraps! With 0 grams of carbs per serving on the Carb Light Living™ Program, these wraps will surely fulfill all of your cheeseburger cravings! Cook turkey in saucepan over medium high heat until browned, stir turkey meat to a crumble. Add onion, mustard, ketchup, and hamburger seasoning to the turkey mixture and mix until blended. Simmer on low for 5 minutes. Rinse and pat dry Iceberg lettuce leaves. Remove turkey mixture from heat and serve wrapped in lettuce topped with cheese, tomato. Carb Light Living™ Tip: CLL suggests to use the Heinz Reduced Sugar Ketchup to keep the carb count down. Regular ketchup contains 4 carbs per tablespoon!